Thanksgiving will be here soon; roasted turkey and dressing are always on the menu. 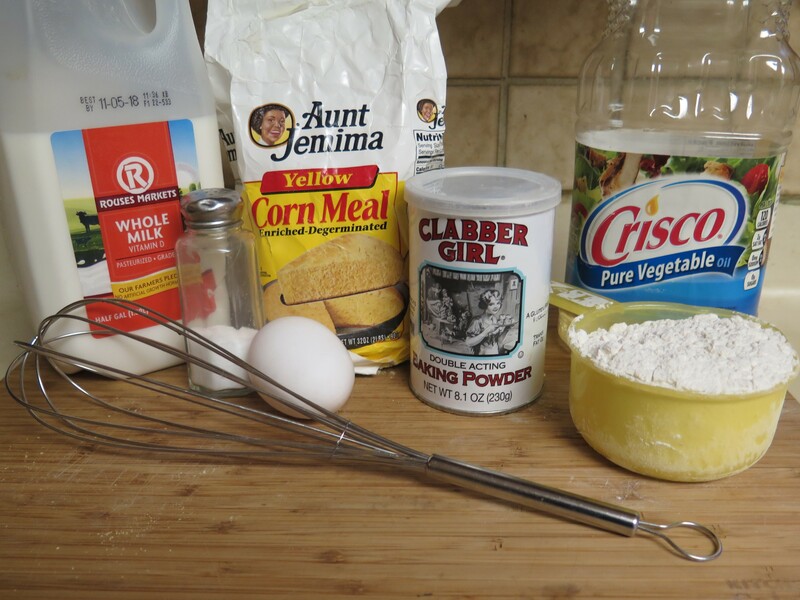 I especially love cornbread dressing; but never have been very successful at making it myself. 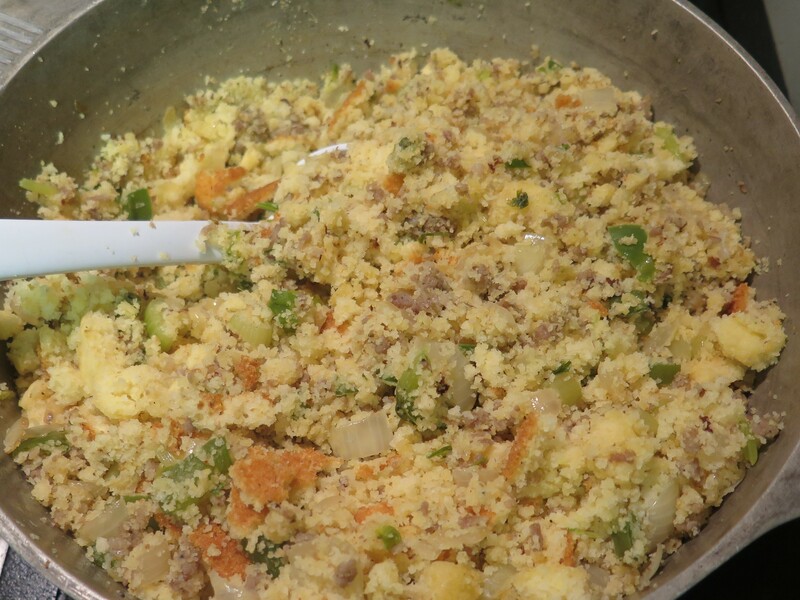 Folks rave about Marie’s Cornbread & Sausage Dressing and she shared the recipe with me. Her recipe has a Cajun flare, it is uniquely Southern with a different twist from most recipe books and magazines. Marie also shared some of her secrets to making the dressing taste special. I’m sure you will enjoy it, too. 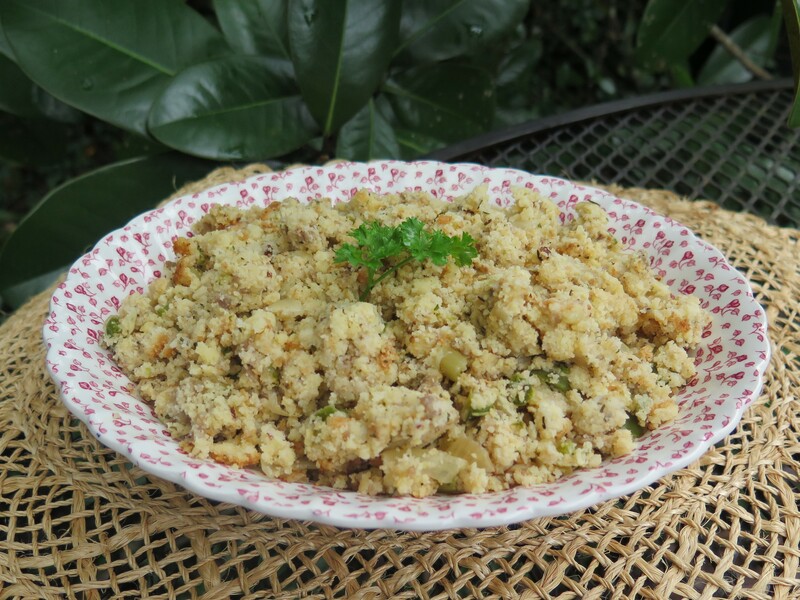 Marie’s cornbread dressing is a moist, crumbly dressing full of flavor. The dressing is not stuffed in the turkey and actually isn’t even baked in the oven. Instead, the final dressing is cooked on the stove. At the Thanksgiving buffet meal, Marie serves the dressing from the stove along with gravy and turkey. The recipe is versatile and goes well with many main course meats. Tonight, I’m serving the dressing with pork chops for my supper meal. Like any dressing recipe, this one involves several steps to make it really tasty. However, most of these steps can be done a few days ahead. The day of the meal, simply put all the ingredients together. When you organize the recipe steps in this manner, it is not a difficult process. The first secret and step to making this dressing is to prepare cornbread from scratch. What, you might say? Yes, from scratch. Marie warns against using prepared boxed mixes such as “Jiffy” cornbread muffin mixes. These have too much sugar and give the dressing an unpleasing taste. Fortunately, cornbread is very simple to mix up and I have a “one bowl” recipe that works well. For my recipe, just add all the all the ingredients together in a bowl, stir to combine and pour into an oiled pan or casserole dish and bake. This step can be prepared several days ahead of time. Here are the ingredients for the cornbread. Yes, the recipe does call for 1 Tablespoon of baking powder; seems like alot; but it is needed to make the cornbread rise. Next, is an optional step. This secret gives flavor to the dressing but it can be skipped if you prefer using canned chicken broth instead. If you have purchased a whole turkey, then the neck, gizzard and heart are tucked inside the cavity of the turkey. These make a flavorful broth. (Finally, a good use for these meats!) Just boil them in water to make a broth and cook the meats. Then remove the small pieces of meat from the neck bones and chop the gizzard and heart. Save the meats along with the broth, too. You can do this step a day or two ahead. The day of the meal, finish the dressing. The dressing includes bulk sausage for flavor. (I used Jimmy Dean brand – regular flavor.) In a large Dutch oven or heavy pot, crumble and brown the sausage. Then add the chopped vegetable (onion and bell pepper) seasonings and cook for 15 minutes. Then add celery and garlic and cook an additional 15 minutes. 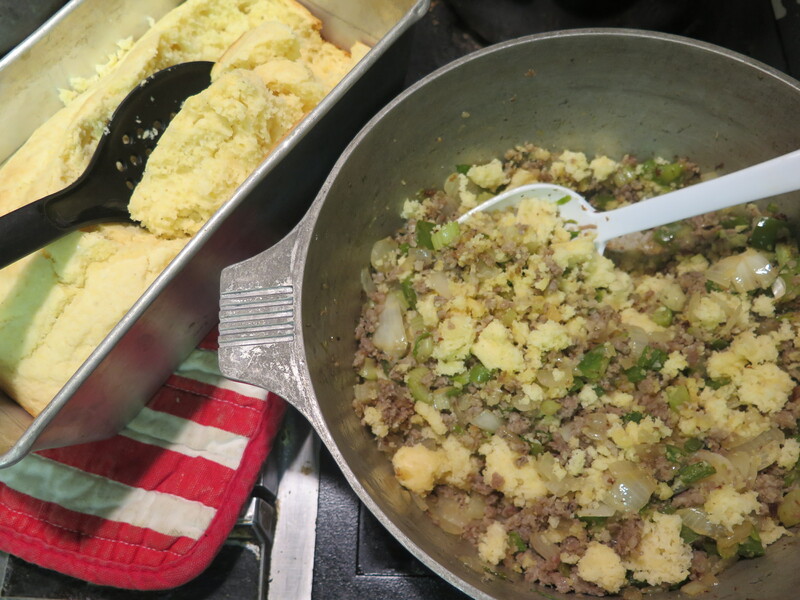 Next, Marie crumbles up the cornbread and slowly adds it to the seasonings and sausage, stirring well after each small addition until all the cornbread is mixed in thoroughly. Last, add the remaining ingredients — the chopped cooked meat (neck, gizzard and heart), a hard boiled egg, parsley and green onion as well as thyme, a tiny bit of sage (optional) and black pepper. For a Cajun flair, add cayenne pepper, more garlic and onion powder. Taste the dressing and add salt and more seasonings if needed. That’s it! Let the dressing sit on back of the stove to keep warm. When ready to serve the meal, Marie serves the dressing from the stove along with gravy and turkey. This dressing is full of flavor. It is nice and moist. I’m sure this will be a crowd pleasing recipe! Preheat oven to 375 degrees. Oil generously a baking loaf pan, 8″ square pan or 8 to 9″ round cake pan. In a large bowl, combine, flour, cornmeal, baking powder and salt and stir. Make a well in the center of the flour mixture. Add the egg, milk and oil. With a wire whip or spoon, stir and mix until all ingredients are combined. Pour into prepared greased baking pan. Bake at 375 degrees for about 30 minutes until browned on top. Remove from oven and cool completely. Cover tightly with plastic wrap; may store for several days at room temperature. 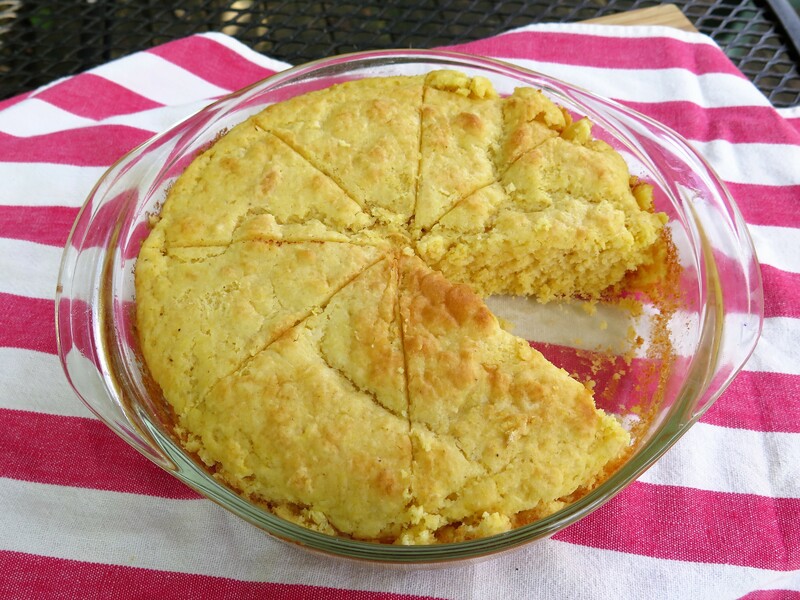 NOTE: To serve this cornbread as a side dish at a meal, increase the baking powder to 2 Tbsp and add 2 Tbsp sugar. Prepare homemade broth and cooked turkey parts (optional): Rinse and drain turkey neck, gizzard and heart. Add these parts to small pot along with 2 cups water. Bring to boil, then lower heat on stove and simmer for 30 minutes until the parts are cooked. Remove the turkey parts and reserve the broth. When cool enough to handle, pick meat off neck bone and chop gizzard and heart. Refrigerate cooked turkey parts and broth separately. May be prepared 1 to 2 days ahead. Bake cornbread according to above recipe. Cool to room temperature and store tightly wrapped. May be prepared 1 – 2 days ahead of time. If desired, pre-prep vegetable seasonings 1 -2 days ahead of time. Chop onion and bell pepper. Place in container to store in refrigerator. 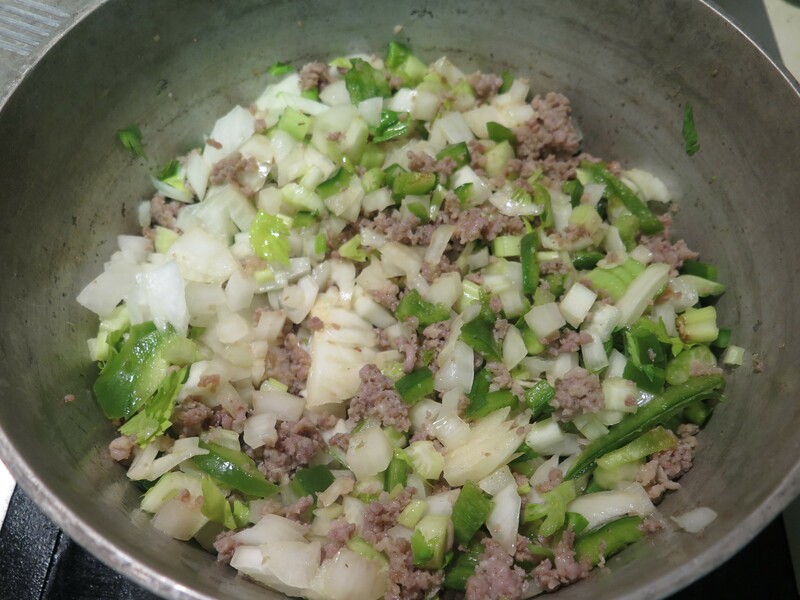 Chop celery and mince garlic and store refrigerated in separate container. To finish dressing, add bulk pork sausage to large heavy Dutch oven or pot. Cook over medium heat, stirring to crumble sausage. Cook until well browned. Drain off excess fat leaving about 2 Tbsp fat. Lower heat to low. Add chopped onion and bell pepper, cover and cook for about 15 minutes, stirring occasionally. Add celery and garlic, continue cooking, covered, for 15 more minutes. Slowly add cooked cornbread in small batches, crumbling cornbread and stirring thoroughly after each addition. Add onion powder, garlic powder, thyme, sage (optional), black pepper, cayenne pepper (optional) and stir well to combine. Add reserved homemade broth or canned chicken broth a little at a time to make dressing moist. Add green onions, chopped parsley and chopped boiled egg and stir thoroughly. Keep warm on stove until ready to serve. Serve from stove with gravy and turkey. 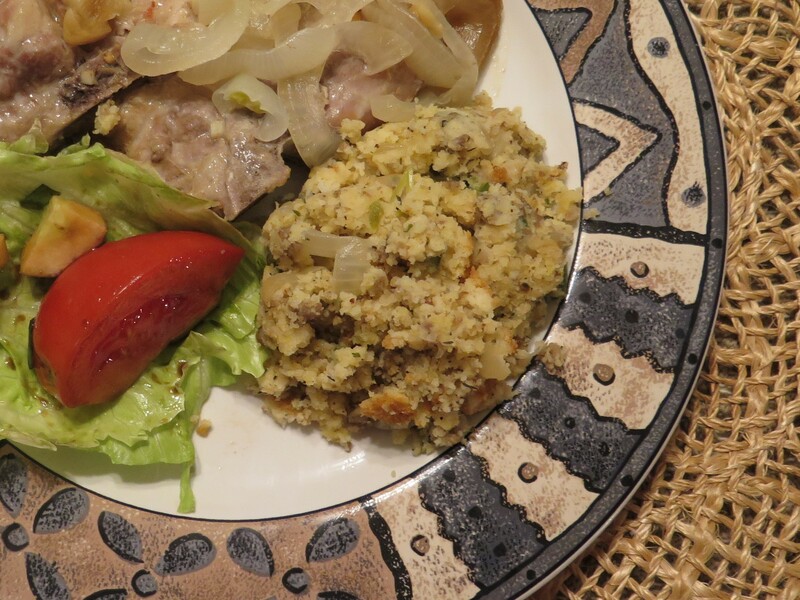 This entry was posted in Recipes and tagged Cajun dish, cornbread, cornbread dressing, holiday, Louisiana Cuisine, Thanksgiving by Maylee at Beyond Gumbo. Bookmark the permalink. A new recipe for me to try out for the holidays! Following your blog for more great recipes 🙂 I made some delicious apple pockets which are a great treat for Thanksgiving, so I recommend checking these out! Thanks for visiting my blog; hope you like many of the recipes.